I have to say, I'd heard a little bit about this re-telling of the Romeo and Juliet story, and thought it might read a bit more like Pride and Prejudice and Zombies. Instead, it was nothing like that. I was pleasantly surprised by the reinterpretation of this story. In this version, Romeo and Juliet are traveling through time - inhabiting the bodies of star-crossed lovers who've had near-death experiences. In each incarnation, Juliet, who is working for the Ambassadors (presumably the good guys) has a limited amount of time to get the couple back together again. Romeo, who sacrificed Juliet (and in some ways, himself) to the Mercenaries in exchange for eternal life, catches up with her, possessing a newly dead body each time, and tries to foil her plans. Wow, the ending! I had a few of my own favorite pet theories brewing, and I sure didn't see that ending coming. I had been hoping that Juliet would realize that she'd been a dolt - that every time she'd been deposited into someone else's life mid-stream, it was actually a chance for her to grab a chance at happiness and realize there is no such thing as a "one true love" pre-destined by fate. I was shocked by the revelation of Gemma's relationship with a teacher, and more shocked by the Ambassadors cold admission that they were going to somehow use the psychic power of the relationship, which suits them just fine. The actual ending felt like a bit of a muddle to me, with time traveling, alternate realities, awful fates for most of our modern day characters (if we find out what happens to them at all!) and Romeo getting the last word. Normally, I'm not one to recommend a book with such a let-down of an ending, but it was still such an enjoyable read - brace yourself for the oddness at the end (perhaps it will all be addressed in a sequel??) and you will enjoy it. 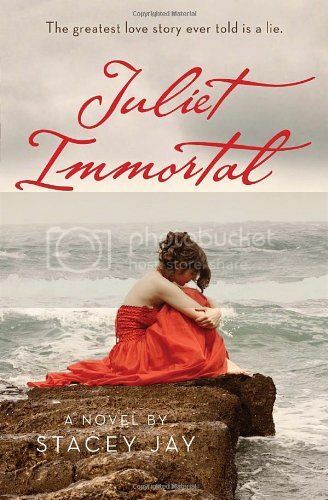 I really liked the characters of Juliet/Ariel and Ben, they made the book worthwhile for me.